Hold an outdoor wedding ceremony and your indoor reception at the Myth golf and Banquets. We offer an air conditioned reception hall that has a rustic feel. Customize our wedding options to fit your style. What sets the Myth apart from other rustic wedding venues and barn wedding venues? The Myth is an enclosed clubhouse in the center of a beautiful golf course. Central air and sunset views inside the clubhouse makes the Myth an exceptional wedding venue choice. Myth is better than a barn wedding with an all inclusive food and beverage package. Our award winning onsite chef and staff are included as well as tables, chairs and linen. Myth is rated 5 stars on the Knot by our brides and grooms. 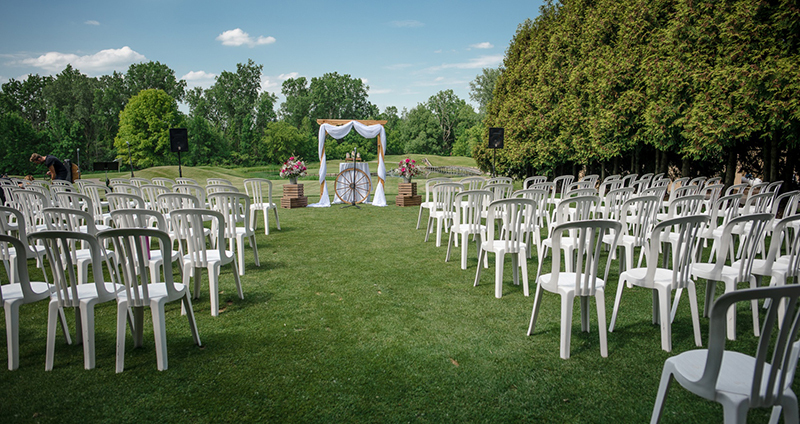 Hold the ceremony next to the covered deck with a green golf course setting.